Want to buy a slice of Lloyd George history? One of his former homes is up for sale. 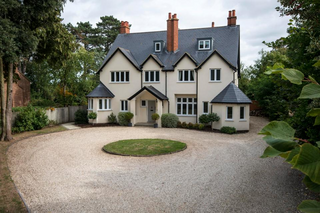 One of Lloyd George's former homes, at Twyford in Berkshire, has gone up for sale at a cost of £2 million. This is a house where LG is said to have lived whilst serving as prime minister before nearby Chequers was owned by the government. When Chequers was purchased as a country retreat for the premier in 1921, Lloyd George moved there from Twyford. One of the interesting features of the property is a large strongroom door to a former cellar area (now a home cinema) where it is believed private and government papers could be securely kept. The property is on offer through the online estate agency Purple Bricks and you can read more about it and see some photos at this link to the Sun newspaper.